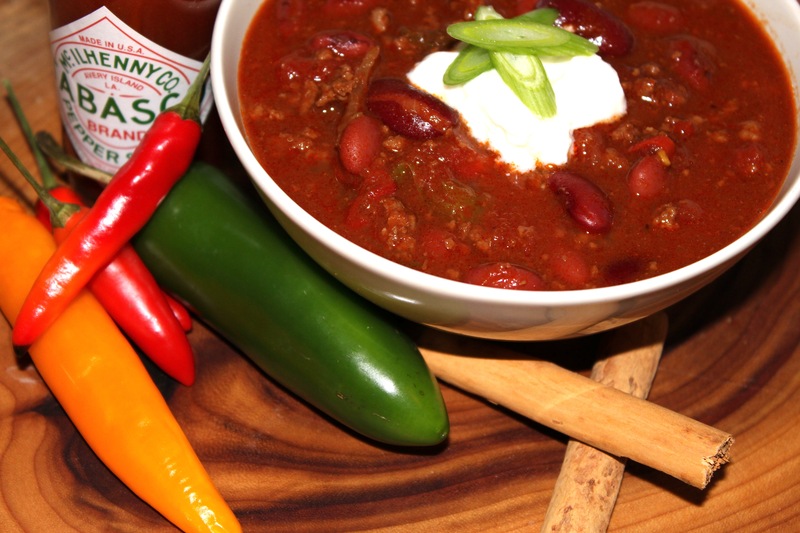 Chilli con carne – perfected over many years… | Hey Bernice! My Husband (Tim) has a signature dish … chilli con carne, and it is amazing. As it should be after 3 years of merging recipes and perfecting the combination of spices and sauces. It is an ideal dish for cold winter nights (or lunchtime!). I love it because of the generous inclusion of vegetables – while Tim is eating what seems to him like a carnivores delight, he is actually getting a good balanced meal! He has asked I explain that whilst there is a recipe to follow, it is really a bit of this and a bit of that … and then add a little bit more of any of the ingredients to taste. One of the key ingredients is dark chocolate, it provides that bonus flavour complexity. I particularly like the addition of this because there is about 3/4 of the block remaining to be consumed with the left over red wine after cooking! This recipes makes a large pot of chilli, which is great because it freezes beautifully, and is ready for those times when you just can’t be bothered cooking. Saute the onion, garlic and chilli in a large pot until the onion is translucent. Add the beef mince and stir until golden brown and the mince has broken down into small pieces. Reduce the heat and add the beef stock. Serve in a bowl on its own with a spoon of sour cream (or natural yoghurt) on top and a sprinkle of finely sliced spring onions or chives. Alternatively you can serve it with boiled white rice underneath. 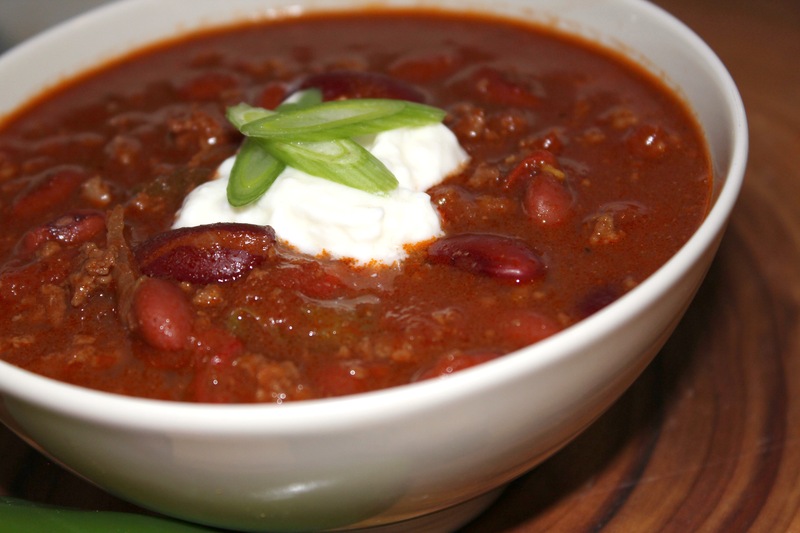 Place the left over chilli in portion controlled containers and freeze – it will last for months. If he used shredded beef instead of mince, it would certainly take it up a notch. I’ve never tried a chilli with shredded beef, will have to give that a go next time – thanks for the suggestion. Tell tim from me, his efforts were……….pretty bloody great! I halved the measures and there was so much liquid I was a bit worried. And in truth it took 4 hours to reduce and I had to pour quite a bit of liquid off, but……it was really so good. I’ve tried all sorts of chilli’s and this is as good as it gets as I strive to find a proper wet, juicy one. A happy night in England!